Background: Skull base osteomyelitis (SBO) refers to infection that has spread beyond the external auditory canal to the base of the skull in advanced stages of otitis externa. Clinically, it may be difficult to differentiate SBO from severe otitis externa without bony involvement. 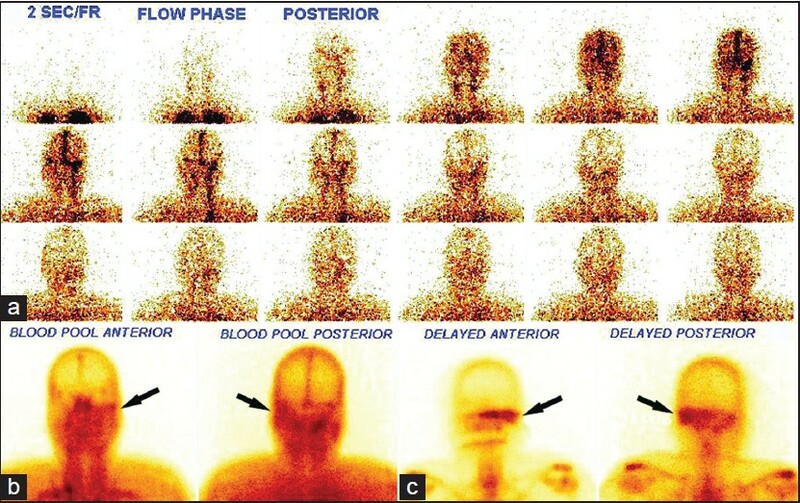 This study was performed to determine the role of three phase bone scintigraphy (TPBS) and single photon emission tomography/computed tomography (SPECT/CT) in detecting SBO. Materials and Methods: We retrospectively analyzed records of 20 patients (14 M, 6 F) with otitis externa and suspected SBO. TPBS and SPECT/CT of the skull were performed. Findings were correlated with clinical, laboratory and diagnostic CT scan findings. Results: All patients were diabetic with elevated erythrocyte sedimentation rate. A total of 18 patients had bilateral and two unilateral symptoms. Cranial nerves were involved in eight patients and microbiological culture of ear discharge fluid positive in seven. Early images showed increased temporal vascularity in nine patients and increased soft-tissue uptake in 10, while delayed images showed increased bone uptake in 19/20 patients. Localized abnormal tracer uptake was shown by SPECT/CT in the mastoid temporal (15), petrous (11), sphenoid (3) and zygomatic (1) and showed destructive changes in five. Thus, TPBS was found positive for SBO in 10/20 patients and changed the management in four. Conclusion: Our study suggests that TPBS with SPECT/CT is a useful non-invasive investigation for detection of SBO in otitis externa. 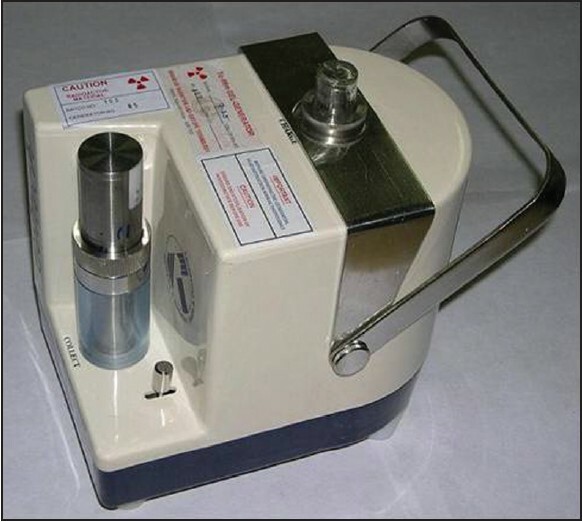 Purpose of the Study: The indigenous design and technology development for processing large scale zirconium molybdate-Mo-99 (ZrMo-99) Geltech generator was successfully commissioned in Board of Radiation and Isotope Technology (BRIT), India, in 2006. The generator production facility comprises of four shielded plant facilities equipped with tongs and special process gadgets amenable for remote operations for radiochemical processing of ZrMo-99 gel. Results: Over 2800 Geltech generators have been processed and supplied to user hospitals during the period 2006-2013. Geltech generator supplied by BRIT was initially not sterile. Simple elution of Tc-99m is performed by a sterile evacuated vial with sterile and pyrogen free 0.9% NaCl solution to obtain sodium (Tc-99m) pertechnetate solution. A special type online 0.22 μm membrane filter has been identified and adapted in Geltech generator. Conclusions: The online filtration of Tc-99m from Geltech generator; thus, provided sterile Tc-99m sodium pertechnetate solution. Generators assembled with modified filter assembly were supplied to local hospital in Mumbai Radiation Medicine Centre (RMC) and S.G.S. Medical College and KEM Hospital) and excellent performances were reported by users. Objective: It is important to ensure that as low as reasonably achievable (ALARA) concept during the radiopharmaceutical (RPH) dose administration in pediatric patients. Several methods have been suggested over the years for the calculation of individualized RPH dose, sometimes requiring complex calculations and large variability exists for administered dose in children. The aim of the present study was to develop a software application that can calculate and store RPH dose along with patient record. Materials and Methods: We reviewed the literature to select the dose formula and used Microsoft Access (a software package) to develop this application. We used the Microsoft Excel to verify the accurate execution of the dose formula. The manual and computer time using this program required for calculating the RPH dose were compared. Results: The developed application calculates RPH dose for pediatric patients based on European Association of Nuclear Medicine dose card, weight based, body surface area based, Clark, Solomon Fried, Young and Webster's formula. It is password protected to prevent the accidental damage and stores the complete record of patients that can be exported to Excel sheet for further analysis. It reduces the burden of calculation and saves considerable time i.e., 2 min computer time as compared with 102 min (manual calculation with the calculator for all seven formulas for 25 patients). Conclusion: The software detailed above appears to be an easy and useful method for calculation of pediatric RPH dose in routine clinical practice. This software application will help in helping the user to routinely applied ALARA principle while pediatric dose administration. Aim: The study aimed at developing a scoring system for scintigraphic grading of gastro-esophageal reflux (GER), on gastro-esophageal reflux scintigraphy (GERS) and comparison of clinical and scintigraphic scores, pre- and post-treatment. Materials and Methods: A total of 39 cases with clinically symptomatic GER underwent 99mTc sulfur colloid GERS; scores were assigned based on the clinical and scintigraphic parameters. Post domperidone GERS was performed after completion of treatment. Follow up GERS was performed and clinical and scintigraphic parameters were compared with baseline parameters . Results: Paired t-test on pre and post domperidone treatment clinical scores showed that the decline in post-treatment scores was highly significant, with P value < 0.001. The scintigraphic scoring system had a sensitivity of 93.9% in assessing treatment response to domperidone, specificity of 83.3% i.e., 83.3% of children with no decline in scintigraphic scores show no clinical response to Domperidone. The scintigraphic scoring system had a positive predictive value of 96.9% and a negative predictive value of 71.4%. Conclusion: GERS with its quantitative parameters is a good investigation for assessing the severity of reflux and also for following children post-treatment. 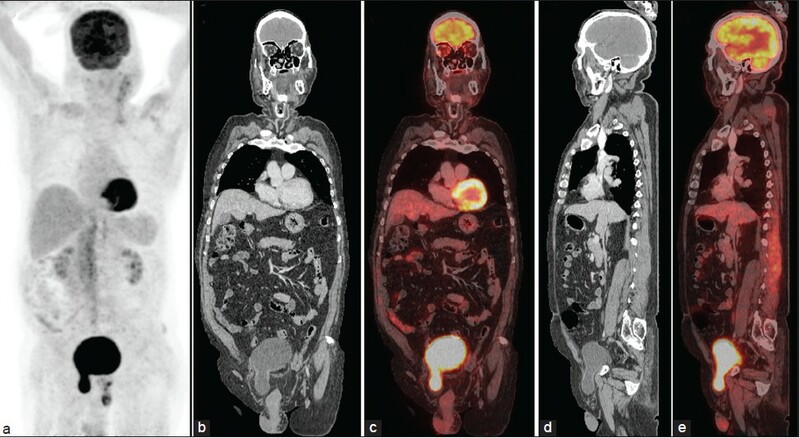 F-18 fluoro-deoxy-glucose (FDG) positron emission tomography/computed tomography (PET/CT) has emerged as a powerful imaging modality in the field of oncology. 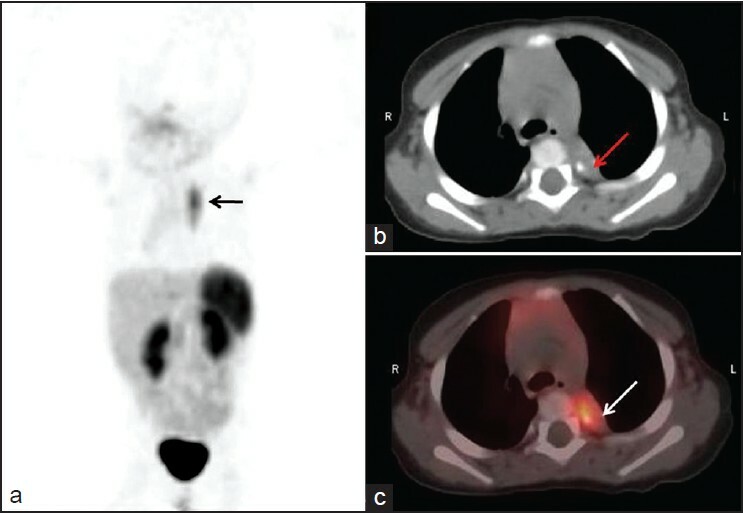 F-18 FDG PET/CT is now an established tool in the management of lymphoma. This has been shown to be useful in staging, detection of bone marrow involvement (BMI), early response assessment and end of therapy response assessment in lymphoma. Interpretation of F-18 FDG PET/CT in lymphoma is carried out by various qualitative response assessment criteria. London criteria are used for interpretation of interim PET/CT and International Harmonization Project (IHP) criteria are used to interpret PET/CT done after the end of chemotherapy. Quantitative analysis is also found to be useful in assessment of response early after two cycles of chemotherapy in patients with diffuse large B cell lymphoma (DLBCL). 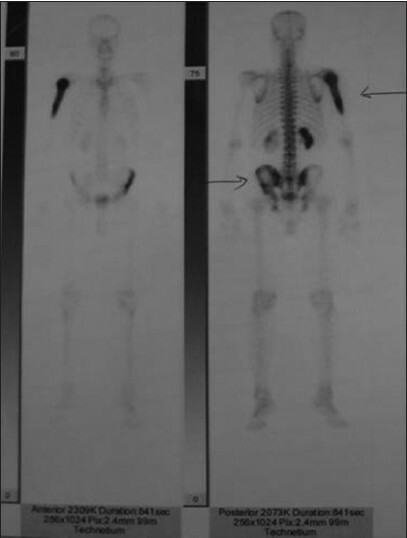 This pictorial essay provides few images describing the FDG avidity of lymphoma, patterns of bone marrow uptake and their relevance in predicting BMI, role of staging PET/CT, quantitative analysis in response assessment, example images of response according to London criteria and IHP criteria. 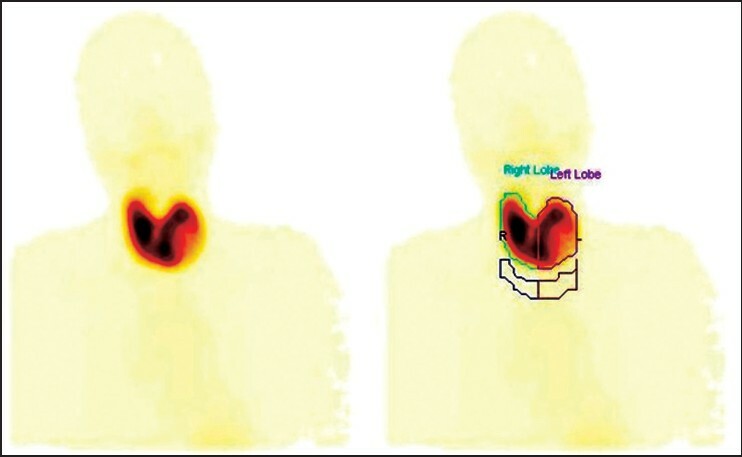 Few pitfalls in imaging of lymphoma with PET/CT are also discussed in the images legend. Hemimegalencephaly is a rare congenital neuronal migration disorder that can presents with the equally rare finding of hemihypoperfusion on brain perfusion single-photon emission computed tomography (SPECT). It is an extremely rare cause of intractable epilepsy. 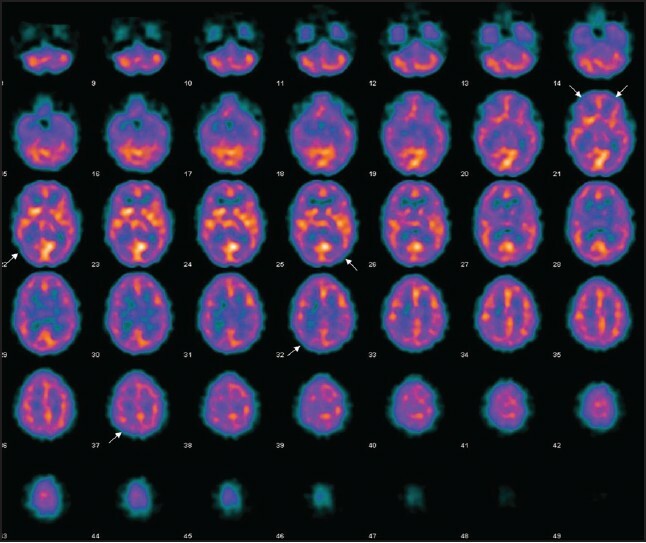 Technetium-99m ethyl cysteinate dimer (ECD) brain perfusion SPECT is useful in excluding other foci of hypoperfusion in the contralateral since hemispherectomy has been suggested to be the treatment of choice. Furthermore, hemimegalencephaly may present with hyper as well as hypoperfusion on ECD SPECT. 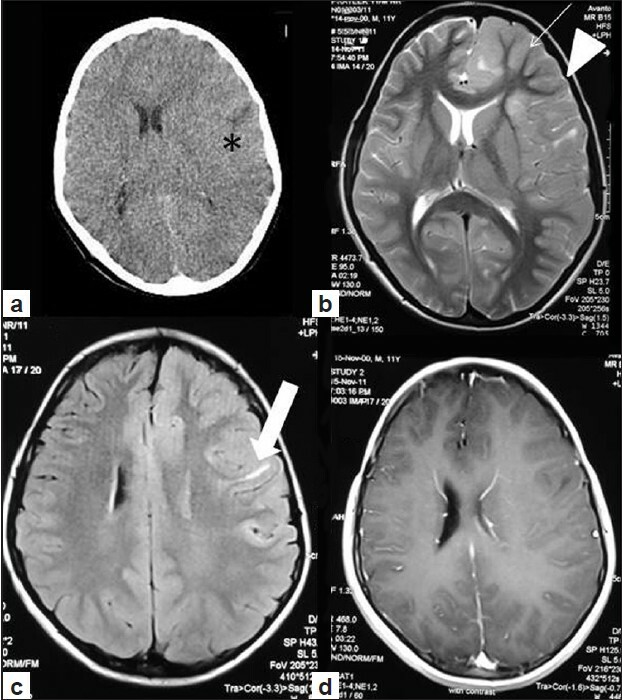 We present the case of an 11-year-old male child with intractable seizures who showed hemihypoperfusion in the hemimegalecephalic hemisphere. Enteric duplication cysts (EDC) are uncommon congenital anomalies that may occur anywhere along the digestive tract. Ectopic gastric mucosa (EGM), another rare condition, is usually present as short segments in the small intestine and may be associated with EDC. Abdominal scintigraphy with 99mTc pertechnetate may be useful in the diagnosis, since the radiotracer is concentrated by functioning gastric mucosa. 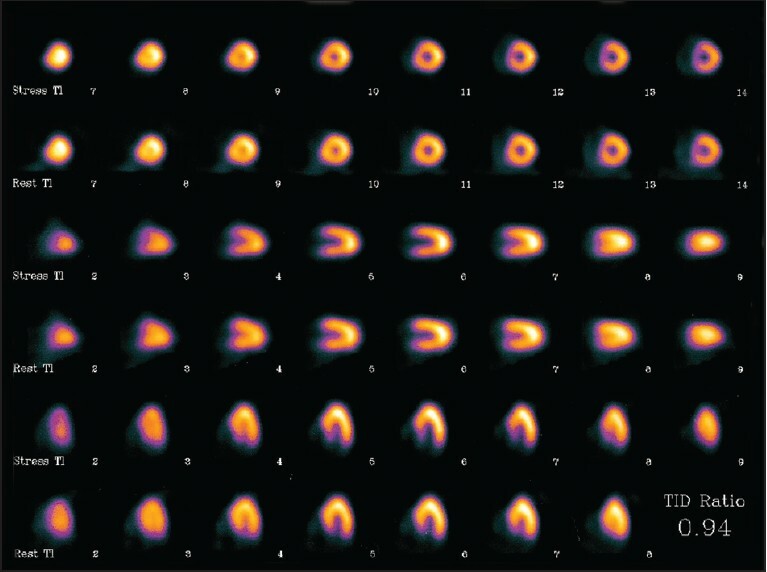 In this case report, the authors describe a child with a 150 cm long jejuno-ileal duplication cyst containing EGM identified by intense 99mTc pertechnetate uptake on scintigraphy without any pharmacological intervention. Area of fat sparing in fatty liver is known to pose a diagnostic challenge in an oncological setting, especially in cancers with higher propensity for liver metastases. 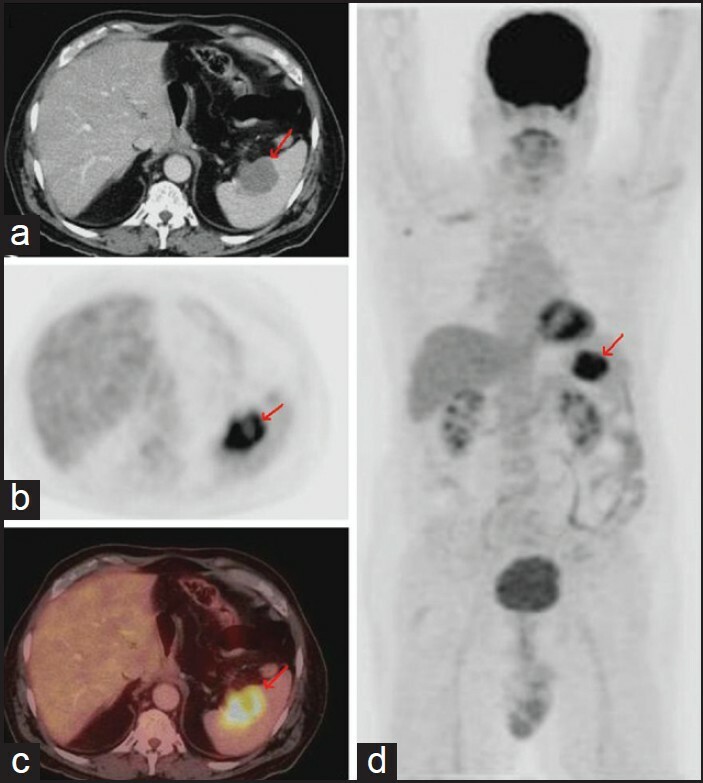 We report an unusual appearance of hepatic metastases in a fat spared area, on both computed tomography (CT) and positron emission tomography (PET), in a combined 18 fluorine-fluorodeoxyglucose (18 F-FDG) PET/CT study done in metastatic adenocarcinoma of colon. We present a 17-year-old female, previously diagnosed of autoimmune hyperthyroidism who had an acute neurological episode and presented high antithyroid antibodies titers, cerebral spinal fluid and electroencephalogram changes. 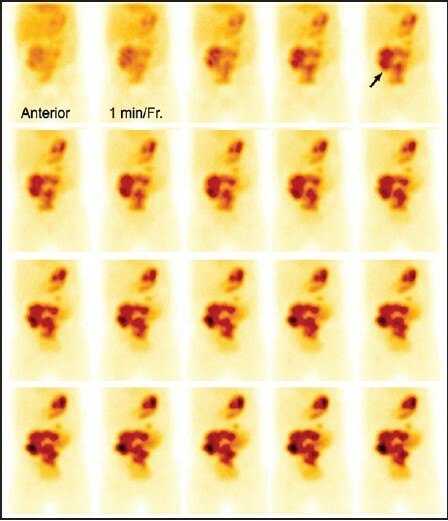 Tc-99m ethylene dicysteine diethyl ester brain single-photon emission computed tomography (SPECT) showed global and patchy hypoperfusion. With glucocorticoid therapy, clinical symptoms disappeared; there was a decrease in antithyroid antibody levels and repeat brain SPECT revealed improvement of perfusion. Minor musculoskeletal injuries usually heal within few weeks with conservative treatment, but in pelvic injuries, symptoms may persist for long duration and patient need medical attention to get relief from disturbing pain symptoms. We present a case of post-trauma osteitis pubis in a 58-year-old female, who reported with lower abdominal and left side hip joint pain since 2 months, after an episode of trivial trauma to her pelvis. 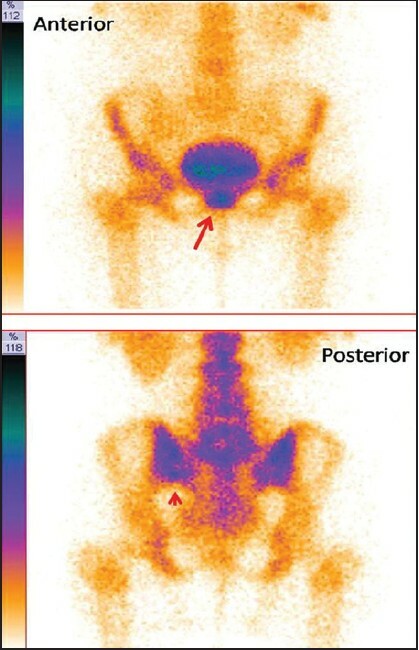 Technetium-99m methylene diphosphonate bone scintigraphy was performed, which confirmed the site of injury in symphysis pubis and left hip joint, by increased radiotracer localization at both of these symptomatic sites. Opsoclonus-myoclonus ataxia (OMA) syndrome is the most common paraneoplastic neurological syndrome of childhood, associated with occult neuroblastoma in 20%-50% of all cases. OMA is the initial presentation of neuroblastoma in 1%-3% of children. Conventional radiological imaging approaches include chest radiography and abdominal computed tomography (CT). 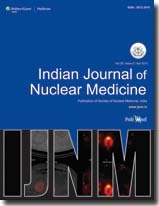 Nuclear medicine techniques, in form of 123 I/ 131 I-metaiodobenzylguanidine (MIBG) scintigraphy have been incorporated in various diagnostic algorithms for evaluation of OMA. We describe use of somatostatin receptor PET/CT with 68 Gallium- DOTA-DPhe 1 , Tyr 3 -octreotate (DOTATATE) in diagnosis of neuroblastoma in two cases of OMA. The authors report a very unusual occurrence of a metastatic squamous carcinoma to thyroid gland from a treated squamous cell carcinoma cervix 12 years before with no recurrence at the primary site. The case also has an additional complexity of rapid progression of the metastatic thyroid carcinoma to wide spread dissemination to lungs and bones while on concurrent chemo radio therapy confirming the aggressiveness of the entity. Myocardial bridging is basically the systolic narrowing of epicardial coronary arteries, secondary to their tunneled course in myocardium. Though it is a benign condition it can have the symptoms like acute coronary syndrome, arrhythmias and sudden cardiac death. We report a 32-year-old male, who presented with typical exertional angina, had positive exercise treadmill and thallium-201 test. Coronary angiography revealed myocardial bridge of distal left anterior descending coronary artery. He was put on β-blockers and was doing well at 8 years of follow-up. A sternal cleft is an extremely rare developmental anomaly, which results from failure of fusion of sternal bars which contribute to the formation of the sternum. Most cases are diagnosed in early childhood, where it is associated with serious other midline defects. 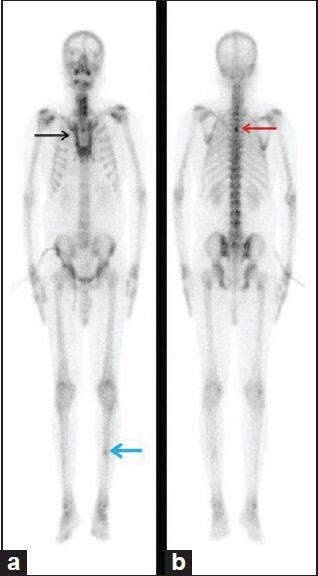 A sternal cleft is seen as a photopenic area on technetium-99m methylene diphosphonate bone scan and can be confused with other conditions. We report an extremely rare case of isolated upper sternal cleft in a 45-years-old male, found incidentally on Tc-99m MDP bone scan. 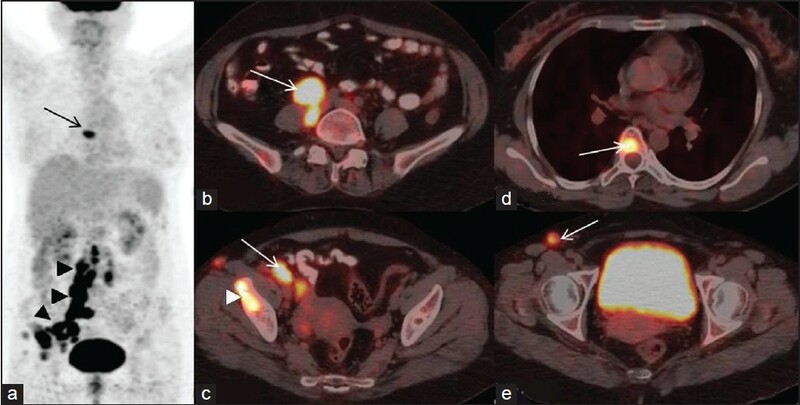 We report a rare case of isolated splenic metastasis from gastric cancer detected with fluorine-18 fluorodeoxyglucose-positron emission tomography/computed tomography (PET/CT). A 55-year-old man with gastric cancer 1 year post surgery, evaluated with PET/CT showed focal, intense uptake in the spleen, with no other abnormal findings. On splenectomy, the lesion was confirmed as metastasis from gastric cancer pathologically. Paget's disease of bone is a chronic bone remodeling disorder. Although most patients are asymptomatic, a variety of symptoms and complications may develop directly from bone involvement or secondarily due to compression by the expanded bone. It is usually diagnosed from radiological and biochemical abnormalities or in advanced cases it becomes clinically evident due to the expanded bone. We report a case of Paget's disease which was detected incidentally during evaluation of nephrolithiasis and polyarthritis but had normal radiographs and normal biochemical markers.